While teams like the Philadelphia Eagles (with Nick Foles) and Minnesota Vikings (with Case Keenum) spent chunks of the 2017-2018 season challenging the idea that great teams are built around quarterbacks, the Indianapolis Colts have done their level best in recent years to uphold that aphorism. Since Peyton Manning’s second season, the Colts have won double-digit games 13 times in 18 seasons, eight-plus games 15 times. In the two seasons they were completely with Manning or Andrew Luck (including last season), the team has won six games combined. The team didn’t have much in the way of bright spots in 2017. Jacoby Brissett, acquired in a trade just before the season, put up a competent 75.2 overall grade after taking over as the team’s starting quarterback in Week 2, meaning the team has a potential starter in case Luck can’t return to start 2018, and/or a backup or trade chip if Luck proves to be healthy. The Colts need help on both sides of the ball heading into next season, but the good news is that, for the first time in a while, they have ample cap space to make moves. 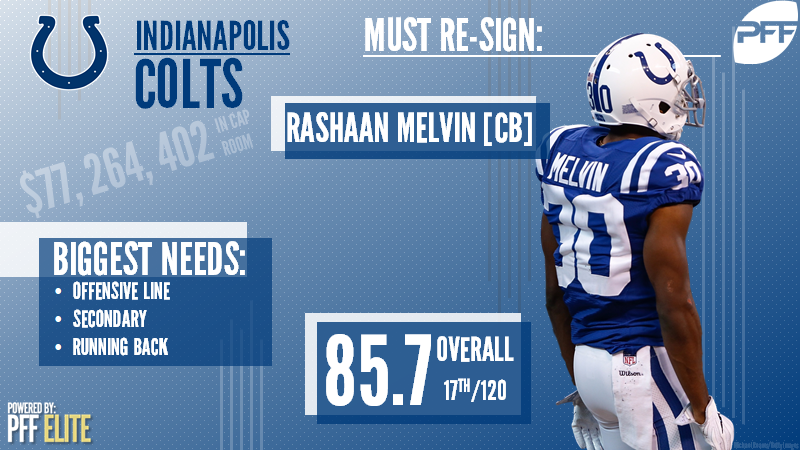 The end of Vontae Davis’ tenure in Indianapolis (and perhaps his NFL career) left the Colts with a hole at cornerback, but Melvin was up to the task, grading out as the No. 17 corner in the league. Pass defense has been a weakness for the Colts for some time – the team hasn’t had an above-average pass-coverage grade since 2014 — but if Melvin leaves in free agency, a rough situation could turn into a dumpster fire. Speaking of areas the Colts have struggled at for a while now, the last time the Colts’ offensive line had above-average grades in run-blocking and pass-blocking, Marvin Harrison still had three years left in his career. The 26-year-old Norwell had the third-highest grade among all guards in 2017, with the highest pass-blocking grade. He won’t fix the line all by himself, but he, Anthony Castonzo, and a hopefully healthy Ryan Kelly could be the foundation of a unit stronger than Indianapolis has had in better than a decade. The Colts used a makeshift, slapped-together group of linebackers in 2017, led by impending free agent Jon Bostic and his 74.7 overall grade. Now that there’s more room in the cap, the team could afford to spend a bit on Williamson, the 25-year-old Titan who put up a career-best 85.6 grade last year that ranked him 10th among linebackers. Williamson was top-21 in the league in both run-stop percentage (8.8) and pass-rush productivity (16.3), and could be a foundation piece for the team’s linebacking core. The oft-injured and touchdown-dependent Donte Moncrief never developed into the running mate to No. 1 receiver T.Y. Hilton that the Colts envisioned when they spent a third-round pick on him in 2014. Landry, who has averaged better than 1,000 yards a year in his four-year career, could be a strong underneath weapon for a team that didn’t have much of one in 2017. Landry has forced 43 missed tackles across the last two seasons, second-most among the league’s receivers to Golden Tate. Hilton’s average depth of target hasn’t dipped below 13.5 yards in the last four years; Landry’s has never been above 7.5. Those two could combine to be among the league’s top 1-2 receiving punches, should Luck prove healthy enough to return to the field.